Pathology Department, Middletown Regional Hospital, Middletown, Ohio. A 19 year old white male was admitted to the hospital because of several episodes of seizures happening at home over a course of months. A neurological exam was unremarkable. A CT scan of the brain showed a tumor mass involving the anterior aspect of the left frontal lobe. It was associated with edema of the white matter. MRI studies confirmed the presence of a tumor mass and suggested high content of calcium and iron. Since the differential diagnosis included an arteriovenous malformation, an arteriogram was done. 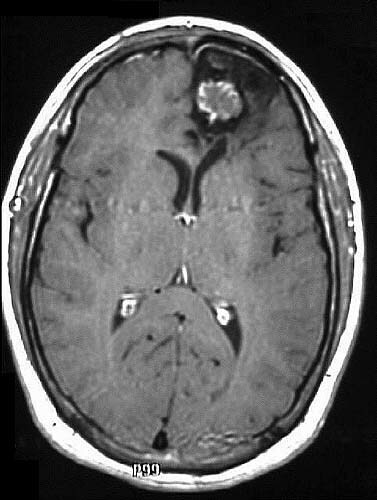 The tumor mass was shown to be avascular. A craniotomy was performed and the pole of the left frontal lobe was resected.